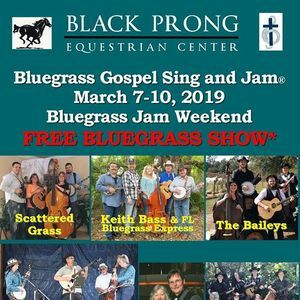 This is the 2nd Annual Black Prong Bluegrass Festival held at the beautiful Black Prong Equestrian Center and Campground in Bronson, FL. It includes a free music show beginning on Friday evening and going through to Sunday morning. 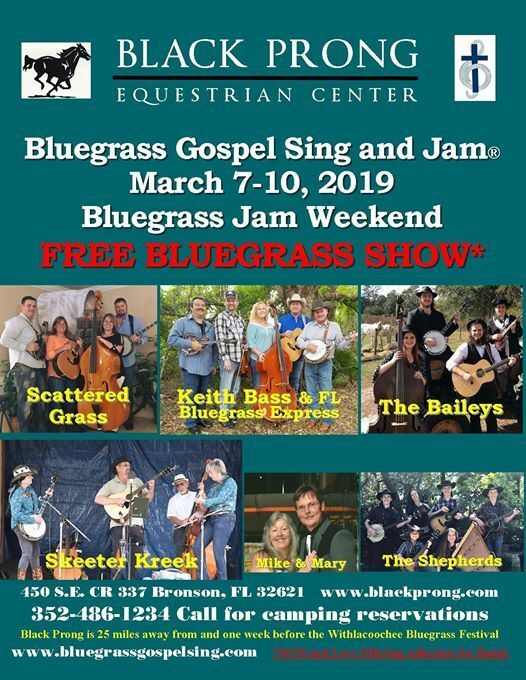 Bands include: Keith Bass & the Florida Bluegrass Express, Skeeter Kreek, The Bailey's, Scattered Grass and Mike & Mary Robinson. In addition, the Shepherd Family will be hosting the Open Stage on Saturday. Pot-luck Saturday night. Welcome Jam on Thursday, 50/50 Raffle and love gift taken up for the bands. Full hook-up, electric/water and rough camping all available. Lots of jamming throughout the weekend. Come and enjoy this beautiful venue.